When looking for a Ducati Monster for sale, there are several things you might want to consider. 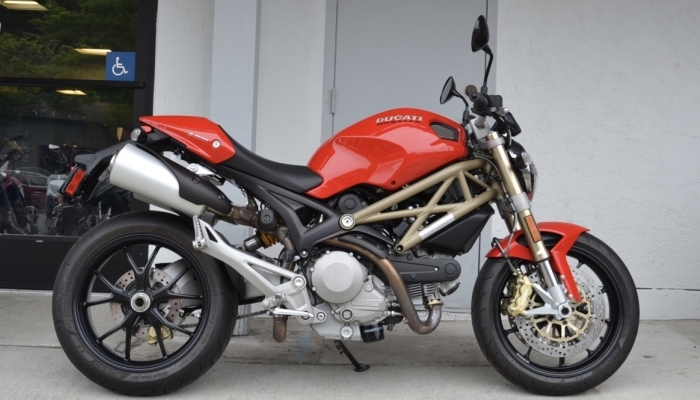 A used Ducati Monster may be something you want to consider, as the pricing of ducatis in general are pretty high. eBay is always a nice place to start looking. Ducati Monsters are heavy maintenance machines and typically require servicing after every 6,000 to 10,000 miles. Check out for a log book with dealer stamps as proof of proper maintenance. Stamps from authorized garages other than dealers are acceptable, though you should be wary of missing stamps. Be careful when thinking to purchase a bike that is embellished with after-market modifications. Such bikes are almost always ridden hard, the people who maintain them may not be as skillful as they’re confident and the performance modifications can be damaging when not done properly. If there’s smoke in the exhaust, it could be pointing to worn out piston rings or valve glides that require repair and replacing. Do not be swayed to buy a smoker because it is a cheap motorbike, it can quickly become the most expensive machine you’ll ever purchase. Remember to look beyond the obvious and always keep in mind the most flashy of units out there are not necessarily the best. There is always a whole set of things to look out for. Many Ducatista have had to deal with faulty electrics. Many of them claim that the fault emanate from letting the machine get wet in the rain. Prior to buying your bike, ensure that its electrics are totally working correctly; fixing them after you buy can turn out to be a very draining task. Many Ducati fans were skeptical about the 2015 Ducati Monster 821 model because it came with a wholly different styling and a new liquid cooling rather than the usual air cooling system. However, upon riding the bike for several days, you’ll concur that it is one of the best models by the Italian maker. At first, the Ducati Monster was targeted for the cruiser market. It was a design meant to maintain the Ducati heritage and still be easy to modify and ride so that the company could take some of the Harley’s Sportster enthusiasts. There have been more than a few Monster iterations produced since the introduction of the lineup in 1993 when the M900 came. The M600 and M750 followed in 1994 and 1996 respectively. The Monsters of the 1990s employed minimalist body work that functioned to give a visual aura of strength and didn’t undergo substantial change until the fuel injection upgrading of the M900 in 2000. The Monster S4 launched in 2001 brought a 4-valve, liquid cooled superbike engine to the Monsters. 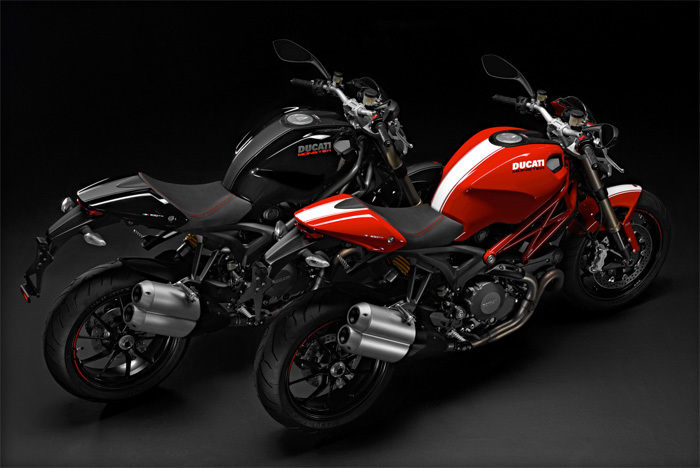 The Monster 1000 and S2R 800 came in 2005, both of which featured 2-valve desmodromic engines. The 796, 1100 and the 696 Monsters have brought massive success to the range and the company as a whole. However, many Ducati loyal fans feel that the wet clutch, cast sub-frame as well as the new headlight that came with the recent models have made the Monster look and feel very different from the motorcycle they love so much. Despite this, the Ducati Monster range has continued to gain massive global admiration with the M696 becoming the first Ducati bike to record sales of more than 10,000 units in a year. The Ducati Monster 821 introduced in 2015 is powered by an 821cc Testastretta 11-degree engine that’s similar to the one found in Ducati Hypermotards and Ducati Street fighters. The engine produces 112 horsepower at 9,250 rpm as well as a sizeable torque of 65.9 foot-pounds at 7,750 rpm. The Monster has three riding modes namely: Urban, Touring and Sport. The Urban mode has a reduced power reaching 75 ponies as well as a decreased throttle response that’s more than perfect when maneuvering through the dense traffic of the city as well as when navigating through wet conditions. The Touring and Sport modes allow you to be carried by the full 112 horsepower, with the later providing quicker throttle response so you can access that power with minimal flick of the waist. The Monster comes with the DSP or Ducati Safety Pack that is loaded with 3-level ABS as well as 8-level DTC or Ducati Traction Control. Both can be adjusted using an on board menu system. Additionally, the different riding modes come with different ABS and DTC presets that can as well be adjusted. The ergonomics of the Monster 821 have been adjusted with the manufacturer opting for a 30 mm longer wheelbase, while the bars have been moved 40 mm higher compared to the Monster 796. Generally, the M821 feels a little steadier, and the riding position is somewhat much more upright compared to the previous versions. Perhaps the biggest change in the Monster 821 is the new 4.6 gallon fuel tank that is now steel, as opposed to the previous plastic tank. This change is largely due to a lot of people complaining that the plastic tanks expand during hot weather. Many Ducatista feel that this tank styling is the biggest departure of modern Monsters from those of old. It’s shaped and designed to enable more functionality and greater fitting for the rider. An inverted 43mm Kayaba fork is used at the front while a Sachs monoshock is utilized at the other end. The front is not adjustable, although the rear is adjustable for rebound damping as well as spring pre-load. A radially mounted twin Brembo handles braking at the front wheel – the dual 320mm discs being grabbed by 4-piston Monobloc calipers. A mono Brembo caliper grabs the rear single 245mm disc. Pirelli Diablo Rosso tires are used to wrap the aluminum wheels of the Monster most of the time. 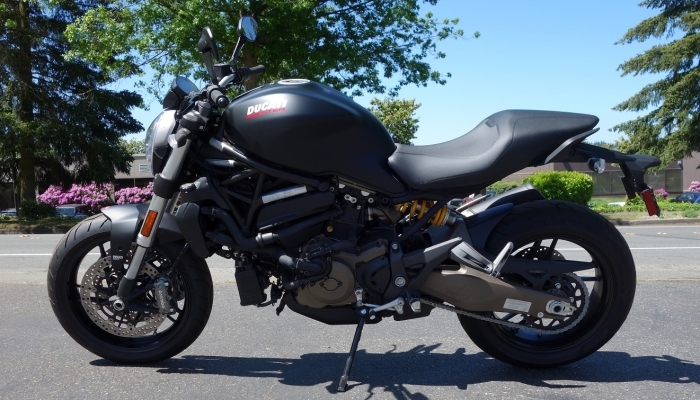 A brand new Ducati Monster 821 goes for $11,495. It is a well made and fantastic motorcycle which is fairly priced when you think through the advantages it has over Japanese options that are in the same price range. However, this price could also mean that people with a comparatively tighter budget will find it difficult to acquire them. 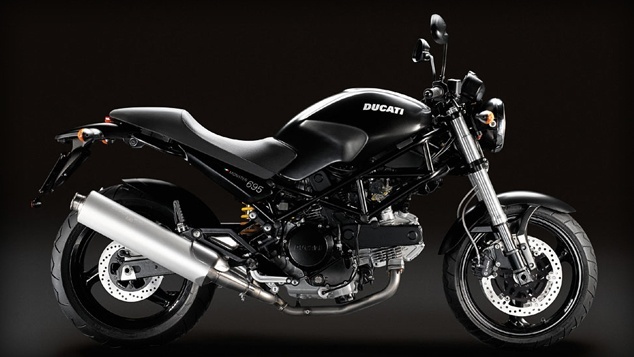 The Ducati Monster 821 is arguably one of the best motorcycles ever made and anybody would be lucky to ride and own it. 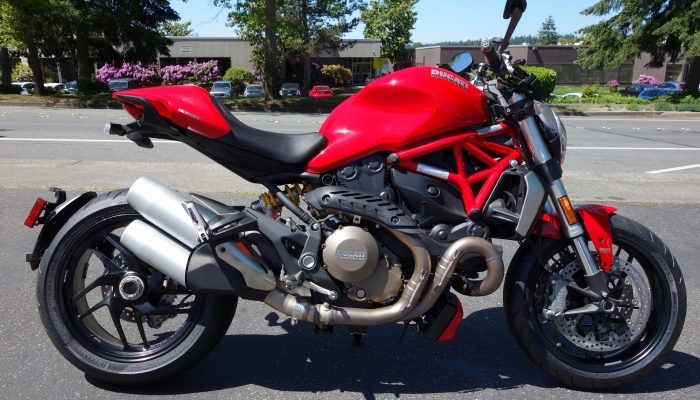 Luckily, you can explore options to buy cheap Ducati Monster by purchasing used Monsters. However, there are things you need to factor in when buying a used Ducati Monster in order to land a good deal.